S. Carolina, Tennessee & Texas. livestock and have also been known to kill humans. controls fire ants without poisons, by eliminating a major part of the ant colony's defences. 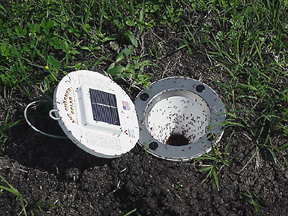 fire ants using only solar energy. No batteries, No harmful chemicals and No baits. Now It's a reality! We now know that the imported fire ant cannot be completely eradicated, but it can be controlled. The SOLAR ANT CHARMER TM does the job without the use of harmful chemicals. 800-472-5024 972-509-2400 Fax 972-509-2401 or E-Mail Us! Press ant for data page 2.